When I began my health and fitness journey in an attempt to lose weight and get healthier, I wondered how I would ever be able to afford to eat healthy on my current budget?! After all, eating healthy is expensive. At first, I was spending more on food at the grocery store than I was previously, however overall, I was actually spending about the same by not eating out. Since I first began eating healthy, I have been able to lower the weekly amount I spend on food greatly. 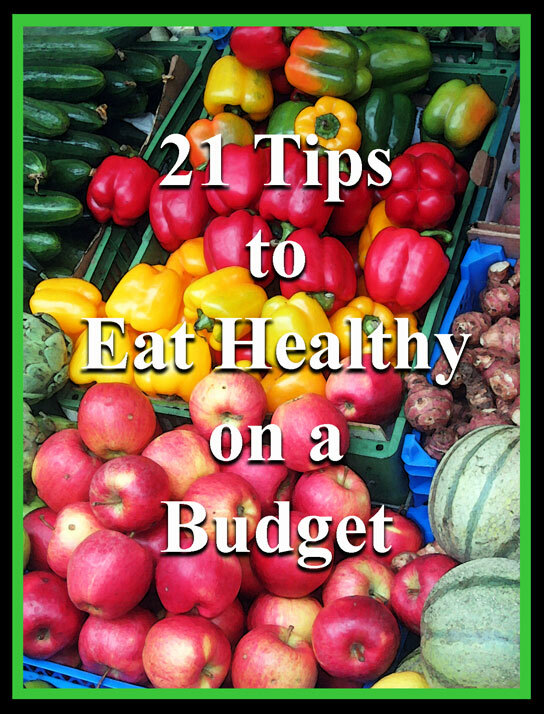 Below are my 21 tips I know will help you eat healthy even on a tight budget. On Friday, I’ll sit down with a pen, notepad, and the grocery store sales inserts. I’ll go through each flyer and make a list of the foods I want that are on sale, noting their sale price. I make sure not add any junk food to my list. I’ll then make a meal plan of dishes for the following week based upon what I can get on sale. Leftovers will be used as the next days lunches. Yes, you will need to be a little creative, but sometimes lean pork loin with healthy olive oil and rosemary sliced roasted potatoes and frozen broccoli are just what the doctor ordered. I hate to admit it, but, I never used coupons before this year. And now, thanks to Passion for Savings, I know how to save the most from coupons. It is absolutely amazing…I will not shop without coupons. I hated the idea of it before I tried it, but now I understand why so many people coupon! Use competitors coupons, most grocery stores will take local competitor coupons with no questions – this is my preference, since I like being able to one-stop shop. Use coupons when items are already on sale. This works great for items that you can stock up on like healthy, frozen vegetables or lean protein sources. Shop alone: Kids, husbands, wives, boyfriends, girlfriends, while making your shopping trip more exciting, probably don’t care what is on or off your list if you’re trying to lose weight or get healthy, and they have no interest. Eat first: Never go shopping when you’re hungry. Don’t wander up and down the aisles: You should not be doing much shopping up aisles anyway, since this is where the most processed foods lie. Most stores only allow card-holding customers to participate in store sales, but you can also receive reward points that go towards future purchases or gas points to help save some money at the pump. After losing my very old rewards card, I had to sign-up again with a new address and was pleasantly surprised when I began receiving coupons for free items in the mail from the store. Spending $15 to receive $2 off my produce purchase of $5 or more or a free bottle of natural salad dressing is well worth it in my opinion. Up front, the cost of buying food in bulk is more expensive. However dollar for dollar, the initial value you receive is well worth paying more up front. Good foods I like to stock up on are oatmeal, brown and wild rices, whole wheat pastas, natural low-sugar spaghetti sauces (when you can find them), and frozen vegetables. If you have a lot of freezer space, purchasing meat in bulk, then separating it into individual servings and freezing can save you lots and lots of money. Think $1.99 per lb chicken breast vs. $4.99 per lb! This one took me a bit of research, but some fruits and vegetables actually keep more of their nutritional value when frozen. NEVER buy canned veggies – the canning process destroys almost all of the nutritional value of vegetables. The only exception is tomatoes. The price of frozen vegetables in my area is usually about about one dollar in savings. Frozen fruits, especially frozen berries, can be a huge money saver – my local grocer carries ten pound bags of Wyman’s wild blueberries for $10. Compare that to $4.99 for 16 oz of fresh farm raised blueberries, and you’re saving some valuable dollars. This tip holds true to the old supply and demand notion. During fruits’ and vegetables’ growing season, the price is lower than it would be otherwise, because they’re not specially storing or shipping anything internationally. I don’t see a huge drop in price when produce is in season, but the taste and flavor is so much better. Here is a handy seasonal chart that tracks not only fruits and vegetables, but also meat and seafood – who knew they were seasonal too?! One of my favorite parts of Spring, Summer and Fall is being able to buy veggies and fruits picked fresh at the local farm stand. Farmers markets often take place on weekends in larger towns/cities, while local farm stands – even though they may seem a little intimating at first until you get to know the usually very friendly people inside – will get you the best produce that is better tasting at a much lower cost…think $1 heads of fresh lettuce vs< $3+ at the grocery store, and who knows where that was grown and processed?! Check out LocalHarvest to find a list of farmers markets and family-owned farm stands. TIP: Purchasing grass fed meat locally is also another option you may want to explore. Per pound you probably won’t save any money, but the quality of the meat is so much better, and it’s so much better for you. eatWILD is a great resource for finding grass-fed meat and dairy products near you. Hopefully, you have already made the decision that soda and sugary fruit juices are not going to be in your diet, because of how unhealthy they are. 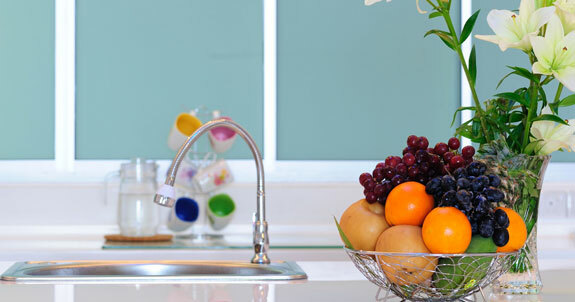 Drinking water is not only good for your health, but it is also much cheaper. Drink purified water from the tap first and bottled water second. And, before I’m asked, yes, you can have tea and coffee if you wish, but caffeine is dehydrating. Tip #10: Don’t Eat Out! This tip alone has saved me over one hundred dollars a month on my food budget. While fast food is convenient and eating out at a restaurant is fun, there is no better way to blow through a food budget than eating out. Keep snacks handy: Protein bars, nuts and trail mix are convenient and travel well. Instead of stopping for food, you can eat a snack to hold you over until you get home and have some real food. Meal prep: For some people, cooking every night is just not possible. Instead, cook all of your meals for the week on Sundays. 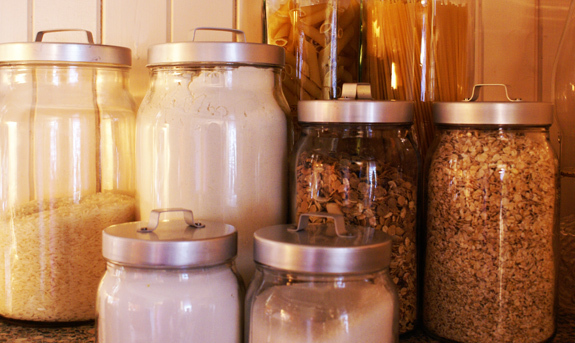 Here is a great guide to meal prep on the weekend, so you can eat stress-free all week. Crock pot meals: Throw the ingredients into the crock pot before going to work and come back to a delicious meal that is better than anything you could have gotten at your favorite fast food restaurant. Fun activities: If going out to eat is your social entertainment for the week, get creative. Play a sport, join a club, or just go for a long walk. I know this is a culture shock for some, but dinner really doesn’t have to contain meat. There is no getting around the fact that lean meats are expensive, so skipping the meat in your meal once a week can save you money. Beans, eggs or even tofu can get you a meal with plenty of protein for a lot less. Your grocery store should have two prices on each item: purchase price and unit price. The unit price is usually in yellow or orange on the left. The unit price shows you cost per ounce or cost per pound. Compare this unit price when comparing weights – not the purchase price. Be careful in the produce section, because grouped vs loose item prices can vary. For instance, it is cheaper for me to buy a 5-pound bag of potatoes than picking out 5 pounds of loose potatoes. However, a bag 5 lemons is more expensive than buying 5 loose lemons – it’s really about being aware of the pricing. Brewing your own coffee at home can save not just a few cents per day, but dollars. I know we all love the convenience of stopping by our favorite coffee place, but it really is a money sucker. If you are too tired in the morning to make your own coffee, look for a pot with an automatic percolator and set the timer the night before to enjoy a nice fresh cup of coffee next morning – that really can be the best part of your morning, waking up to the smell of fresh coffee. Brewing your own coffee saves you about two to five dollars each day, depending on your coffee shop prices. Note: coffee shop prices vary greatly by location – even franchise prices are not the same from location to location. For instance, the is priced at least a quarter more than the one with a drive-thru I pass on the ride home. Those little frozen dinners you see labeled healthy and lean are not very healthy for you (think lots of artery-hardening sodium to start). Plus, they are very expensive. Yes, they may seem convenient, but cooking your meals from scratch is really the way to go. This way, you know exactly what is being put into your recipes, and you can just freeze the leftovers to now have your own frozen dinner. Just to rant: Yes, your frozen $2.50 microwavable dinner might be less than 200 calories, but it is loaded with sodium. In addition, how much food do you really get with this…a couple bites that keep you full for about five minutes?! Plus, they can really smell up a windowless office! This set up for food that is about to expire such as bread, fruits, vegetables and meats in the different sections of your store. They’re usually placed towards the back of the aisles. You can sometimes get lucky and find amazingly low prices for food that you could use that night or to bring home and immediately freeze. Big name brands usually advertise a lot, and let’s face it, advertising costs lots and lots of money. Generic or store brands don’t need to advertise, since they just stick these items next to the name brands. Most generics use the same exact ingredients as the name brands, so why pay more for a name? Downloading apps can you get special promotions. Some lists that I have joined send an email with a $5 off coupon every week, while others don’t send you anything good in which case, I unsubscribe. If your personal inbox gets overwhelmed, set up a separate email account for list joining. Vegetables are cheap and keep you full. Having a vegetable with every meal, even at breakfast is not only good for your health, but also your pocketbook. I try to cover at least half of plate in vegetables or have a small salad before every meal. This is just a small tip to trick your body into eating less calories, while feeling satiated. One of my favorite suggestions to people is that “Trader Joe’s has cheap nuts.” Specialty health stores often carry grains and nuts in large bins where you have to scoop or pour your own. You can also freeze shelled nuts for about 6 months – unshelled nuts will last a very long time left out. Buy in bulk, and the savings will quickly add up. Not only will planting and harvesting your own garden get your body some vitamin-D, you’ll also save you lots of money. You do not need a lot of space to grow your own vegetables with container gardening or the square foot gardening technique. I personally have a small 12×12 foot garden that has cut the food bill a little, but I’m still amazed at how much different the food from your own garden tastes. Here is my list of healthy, staple foods. If you keep mainly to this list, you can eat healthy on any budget – especially when they’re on sale or if you buy them in bulk. Apply the above tips to other areas of your spending – clothing, supplements, etc. Keep an eye out for how sales run on a cycle basis, so you can plan ahead. And last, but not least, do not let food spoil! This could easily be the greatest waste of money. I’ve been guilty of it myself, leaving precooked chicken breast in the fridge past one week, but now, I keep track of everything’s that’s in my fridge and make sure it gets eaten.